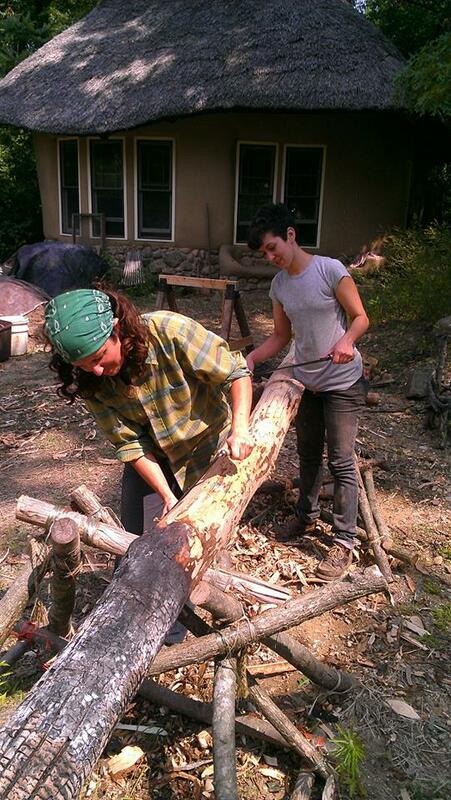 Emily and Kerry – using the draw knife to de-bark round poles we harvested. This is a one week immersion in living and learning in community. You will get a chance to learn the basics of a natural building skills on existing building and demonstration stations. This course will include hand-on training as well as classroom presentations on essential building considerations. 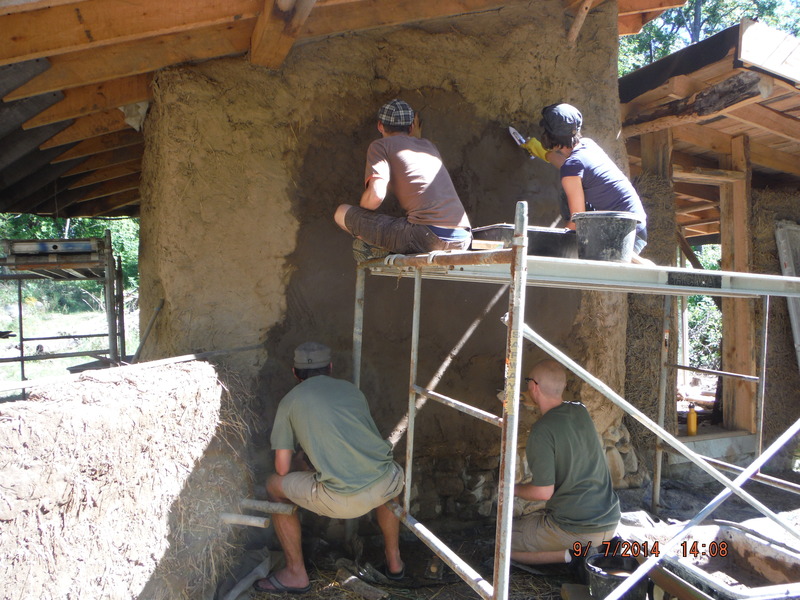 * earth plasters, finish plaster, earth floors, & sculpting: learn how to find, identify, harvest, mix and apply plasters in various setting. * round poles framing: how to harvest, prepare, notch & lash round poles for building small structures. * thatching with phragmite reed grass. How to design a thatched roof. Demonstration, some hands-on. 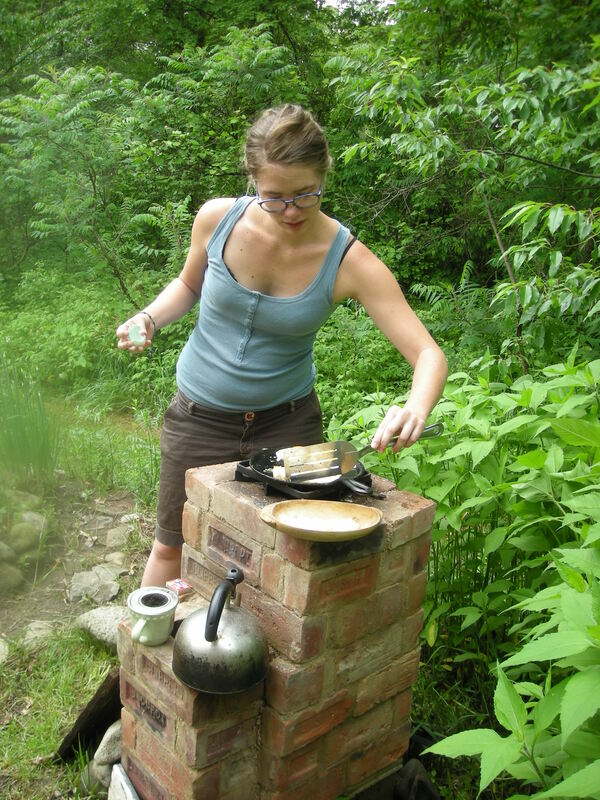 This is an exceptional opportunity to get training in such a wide range of skills, in an environment that includes Rocket Stoves, Earth Ovens & more. 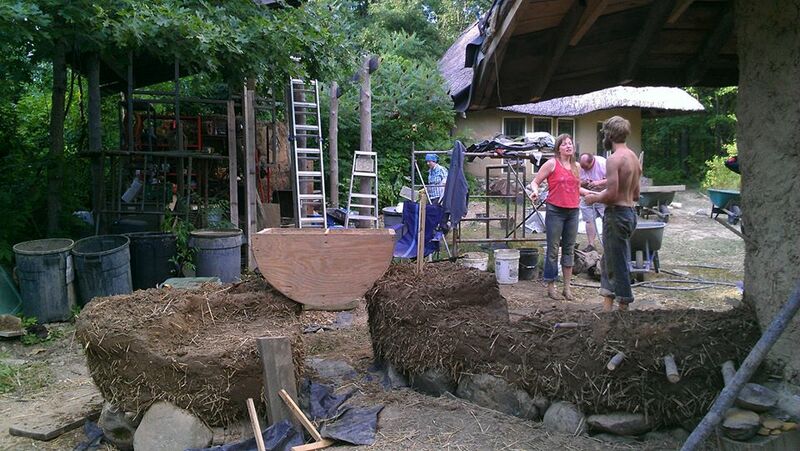 This program is a collaboration between the Strawbale Studio, The Natural Cottage Project and the MI Folk School. 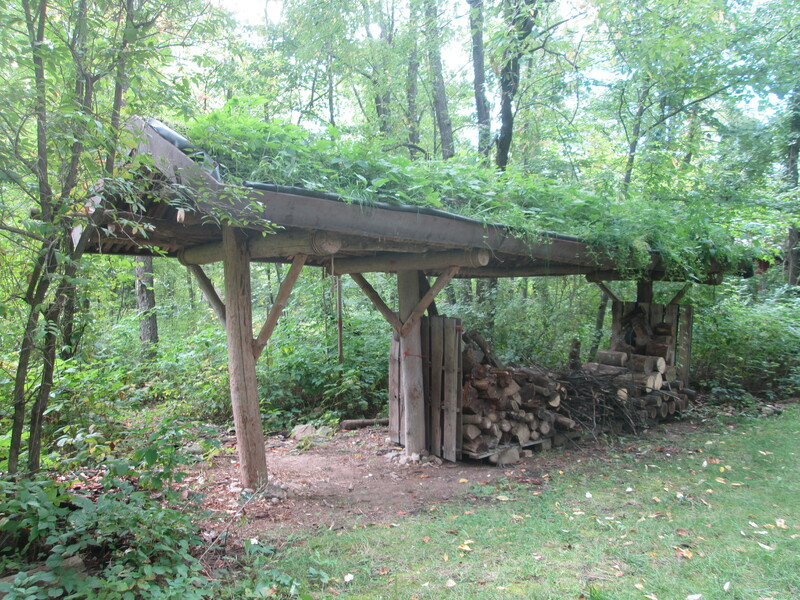 ** Living Roof Woodshed. Round pole with wooden pins. * Foundation & Drainage essentials. Gathering Space overlooking the Strawbale Studio. On 50 acres of land. 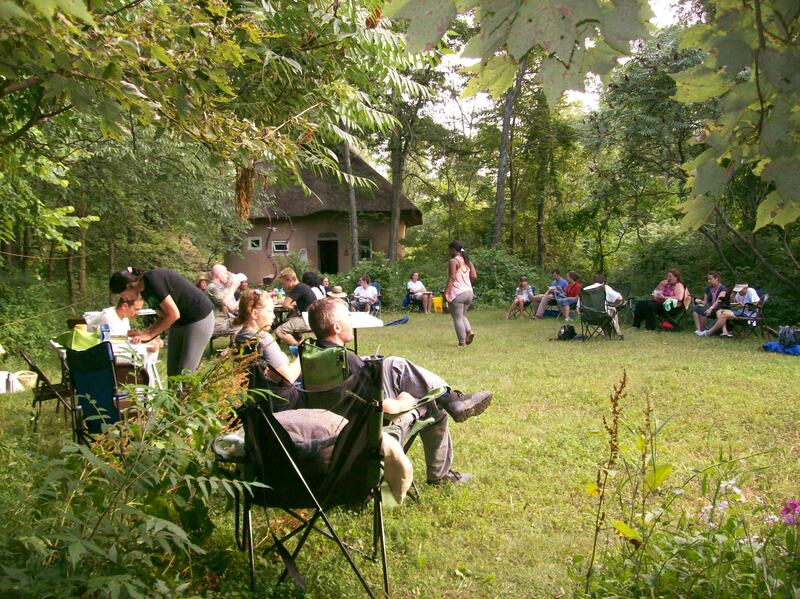 The setting is the lovely Strawbale Studio land, wooded and rural, 1 hour north of Detroit Michigan. Facilities: Camping on the land is part of the course cost, and some indoor spaces may be available for a fee. Vegetarian food will provide a healthy and tasty aspect to each day. Participants are asked to contribute 1 hour a day toward infrastructure, such as food prep, etc. More information to come. Fee $650 paid in full by July 12th, and $750 thereafter. Discounts for groups. Several 1/2 pay Worktrade positions available. Cooking on the Outdoor Rocket Cooker. Other cooking devices on site include the Earth Oven, Solar Cooker and Haybox Cooker.